Crafted of powder-coated steel, our decorative wine rack safely holds 5 full wine bottles + 4-8 stemware glasses. Tilted design keeps corks moist, protects wine from oxidation. 25.5" x 18.75" x 6"
Have you ever tried to extract a wine cork, only to see it break & crumble? Then, when you sip the wine, it tastes bitter & has an odd odor. That's caused by premature oxidation. It can result when the cork is too dry. 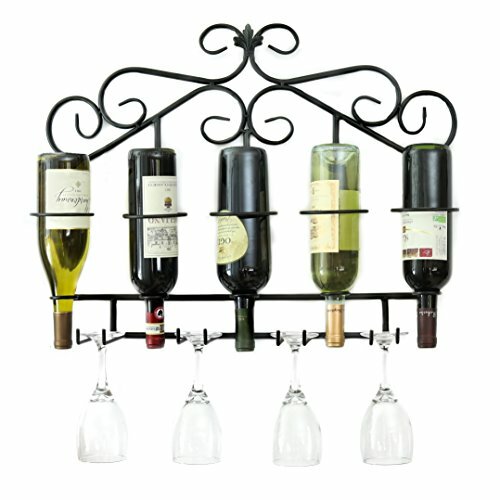 Solution: this elegant wine rack from ProCore Products. Unlike wine-storage units that keep bottles upright, this one tilts bottles upside-down. That way, corks stay moistened with wine, so they won't dry out, shrink, or disintegrate. Result: The seal stays intact... and the wine stays fragrant & flavorful. Your new wine organizer comes with all necessary hardware, so you can hang it right out of the box. Each bottle is supported by 2 separate brackets - 1 large ring for the middle & 1 smaller one for the neck - so bottles won't slide, tip, or fall. Order now for yourself & your gift list. Holds 5 Wine Bottles & More: Made of strong, coated steel, your new hanging wine rack won't split, bend, or break like wood or plastic. Safely stores 5 full wine or champagne bottles + 4-8 glasses. 25.5" x 18.75" x 6"
If you have any questions about this product by ProCore Products, contact us by completing and submitting the form below. If you are looking for a specif part number, please include it with your message.